It's finally below 85 degrees and life doesn't feel so unbearably hot. That means its casserole season right? Wait, do casseroles have a season? They seem to in my kitchen when it’s simply too hot to cook. I cracked open my Better Homes & Gardens Biggest Book of Casseroles for the first time in several months, and decided this very American, creamy, salty, gooey, blob of a casserole was what I wanted to welcome the start of fall with. It was even good the next day, which was helpful because we had a lot of casserole to consume! 1. Cook rice according to package directions. Remove from heat and stir in 1/3 cup of the diced onions. Transfer to a 2 ½ quart casserole dish or a 9x13 inch rectangle baking dish. 3. In a large skillet warm 2 tablespoons of cooking oil over medium high heat and add the chicken pieces. Salt and pepper the chicken and turn once when the bottom starts to turn golden. Finish cooking and add the crushed Italian seasoning and minced garlic and cook for a minute longer. Remove the chicken from the pan reserving the drippings. 4. Warm 2 Tablespoons cooking oil in the pan on medium heat and add the onions. Cook for 1 minute and then add the cornstarch and cook for about 2 minutes. Add the milk and bring to a simmer. Simmer until reduced slightly, about 4 minutes. 5. Turn heat to low and add the cream cheese and stir until almost combined. Add the chicken, diced ham, chopped broccoli, parmesan, and dash of salt & pepper. Stir to combine and warm through. 6. Once warm, move to a casserole dish and cover the rice. Plunge a spatula in several places to incorporate the rice and sauce but do not mix. Bake for 30 minutes for the 9x13 inch pan or 45 to 50 minutes for the 2 ½ quart round casserole. 7. Remove from the oven. Toast the sliced almonds for 40 seconds on a plate in the microwave and sprinkle over the casserole. Wait 10 minutes and serve. Assemble as directed. 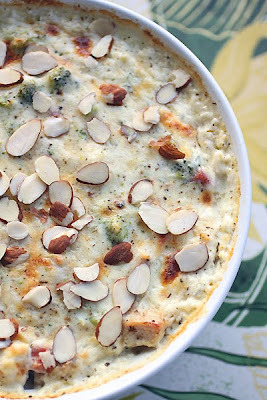 Cover unbaked casserole with heavy foil; seal, label, and freeze for up to 3 months. Thaw covered frozen casserole in the refrigerator overnight (casserole may still be icy). Bake casserole, covered, in a 350 degree oven for 1 hour. Bake for 20 to 25 minutes more or until heated through. Sprinkle with almonds. Recipe adapted from BH&G’s Biggest Book of Casseroles. Picture by Laura Flowers. Gee!This sounds so good!Looks good as well! I can't wait until casserole season starts here in the desert. Unfortunately, our forecast is still high 90s, low 100s for the forseeable future. Ugh! Once it cools down (in November?) I'm trying this one. It sounds delicious. Woohoo... a reason to use up that Italian Seasoning I purchased ;). Seriously, I love the sound of this dish... ham and chicken are great together, broccoli and cheese are great together, what's not to love?